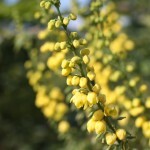 An upright, vase-shaped shrub with large sprays of bright yellow, winter flowers. The late summer berries are dark blue. It is disease resistant. 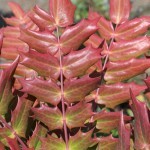 Has large dark green spiny leaves and is bold and symmetrical in form. 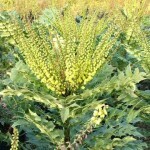 Grows best in part shade and normal to moist soils.